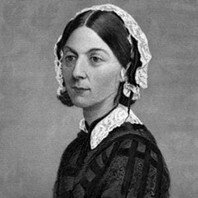 Celebrated British social reformer and statistician who is considered the founder of modern nursing. Later in her life, she worked in India studying the effects of sanitation in rural life and helping to improve the country's health services and medical care. What the horrors of war are, no one can imagine. They are not wounds and blood and fever, spotted and low, or dysentery, chronic and acute, cold and heat and famine. They are intoxication, drunken brutality, demoralization and disorder on the part of the inferior... jealousies, meanness, indifference, selfish brutality on the part of the superior. Volumes are now being written and spoken about the effect of the mind on the body -- I wish more was thought of the effect of the body on the mind. Live you life while you have it. Life is a splendid gift - there is nothing small about it.